You'll be £4.99 closer to your next £10.00 credit when you purchase Tracing Your Ancestors through Death Records. What's this? A useful reference book full of invaluable information reinforced with examples, case studies and research tips punctuated throughout with pointers to both online and archival sources. This latest release will no doubt provide much welcome information to many researchers. Very useful. Helpful case studies throughout the work. These studies provide a great way of illustrating the type of information a given record source can provide. 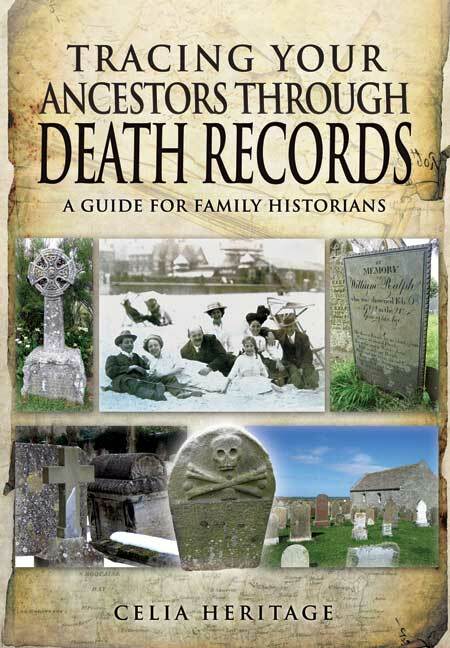 Anyone with UK ancestry will find this book of interest as a very useful guide to exploring the records of death in depth. How to find out more about your forebears using these under-utilised records. Her focus on historical context makes the book an interesting read. The book is illustrated with copies of documents found during the author’s hunt for her own family history. Online searching is emphasized, accompanies by lists of useful websites. But also described are books that help locate and interpret date. The information in this book will be most useful to those searching for antecedents in England but sources of date in Scotland, Ireland and Wales are discussed where those differ from English laws and documents. She includes sources for North America but these are not presented with the same depth. ‘Killing off’ your ancestors is an essential part of family history research when you can, ironically, unearth a surprising amount about their lives. Family Tree author Celia Heritage’s excellent guide to the records created by an individual’s demise – and what these records can tell you – feels like a long – overdue visit by an old family friend. We all know we should be buying death certificates to tie up those loose ends, but they are often neglected as we get caught up in the joyous discovery of new marriages and births. But in doing so, as Celia genially explains, we miss out on a huge aspect of our ancestors’ lives and the opportunities for further research in sometimes unexpected places. But it’s not just the value of death certificates tat are covered here; she also examines common brick walls and pitfalls, from mistakes in the General Register Office Index to aliases and name – changes. She explains how to get the most from burial records and casts her expert net over gravestones, memorial inscriptions, inquest reports, wills and other probate records, obituaries and more. It is packed with case studies, illustrations and advice to reinvigorate your research. Pretty much all you need to know about death records, with simple explanations and problem – solving tips, I wonder why this has never been done in this way before. Authoritative and practical, it will prove a big help to beginners and battle-weary genealogists alike and Celia also has a book blog at deathrecordsblog.wordpress.com. This volume looks at the common pitfalls in researching ancestors – you’d think that a death certificate was common throughout our histories, but Celia unveils different types of death records and explains how in some cases they contain far more information than we would expect to find. Quite often we forget that a death record may be entered under the person’s married name rather than their maiden name – all of these things are covered in Celia’s excellent treatise which is both readable and illuminating, and another vital tool to enable you to get the best out of available records. Superb. Celia Heritage leads readers through the various types of death records, showing how they have be found, read and interpreted - and how to glean as much information as possible from them. In many cases they can be used as a starting point for developing your family research into other equally rewarding areas. This highly readable handbook is packed with useful information and helpful research advice. In addition, a thought-provoking final chapter looks into the repercussions of death – its effects of the surviving members of the family and the fact that a premature death could sometimes affect the family for generations to come. Many family history books cover death records, but in chapters or sections within a larger whole. A book that deals exclusively with the subject in much more depth is therefore very welcome. Of all the life events, death records are the ones most likely to be overlooked by researchers, and the author rightly reminds us that we should pay just as much attention to them as to births and marriages. The book begins with the civil registration of deaths, then burial records of various kinds, followed by chapters on gravestones and inscriptions, inquests, newspapers and periodicals, wills and probate and that inevitable ‘miscellany’ chapter- indeed, there are always items in family history research that do not fit neatly into the general categories. In this case, the author covers memorial cards and funeral records, tontines, heraldry, manorial court rolls and inquisitions post mortem. Each of these sources may interest only a minority of researchers, but many will find at least one item to be of use. The final chapter is perhaps the most valuable, because it actually puts the official written records into context. It’s sometimes easy to forget while we get caught up in our research that the death of an individual would have led a significant – and sometimes catastrophic effect on surviving family members. There are useful case studies throughout the book and a good bibliography at the end, along with source notes, useful addresses and an index.